From working at the scene of a house fire at Nubeena one day to gathering evidence surrounding a washed up body on the shores of Abels Bay the next, it’s lucky that Tania Curtis likes variety and exploration. With 23 years’ policing experience, primarily in crime scene examination, Tania has a fascination for piecing forensic evidence together and an unending curiosity for how things work. “Scientific” (as it was then called) was one of the main reasons Tania became a police officer, utilising her love of art and science in the best way possible: helping others. In 2011 she was deployed to New Zealand to work in Disaster Victim Identification following the Christchurch earthquakes, which killed 185 people and injured thousands. It was a deployment for which she later received a Humanitarian Overseas Service Medal. “After 23 years I know the skills I can apply to the job – I know how I can assist the officers on the ground and I know what they require from me,” she said. There are always new things to learn in Forensics and a current focus for Tania is the implementation of a digital workflow for footwear examinations and the development of a footwear database. Tania’s interest in footprint evidence goes back to the 1995 Victoria Cafasso murder investigation, where she was asked to examine a number of negative footprint castings taken from the sand. “From a footprint casting we can tell you so much about a crime scene … from the gait of the crook, whether they were running or walking, how many people were there etc,” she said. 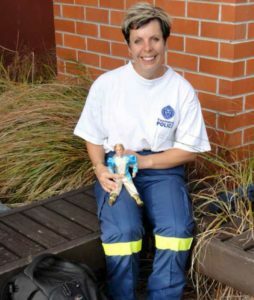 Above: Constable Tanya Curtis with the ‘Ken’ doll mascot used for DVI training. This page -- https://www.police.tas.gov.au/about-us/100-years-women-policing-tasmania-police/women-specialist-roles/love-science-helps-others/ -- was last published on February 13, 2018 by the Department of Police, Fire and Emergency Management.